Even in the brief moments that he was a Minardi driver in 1997, much was expected of Jarno Trulli by those who knew of his speed and panache in karting where he had won national, European and, ultimately, world championships. The previous year had marked only his first full season in cars, after graduation to six races in German F3 midway through 1995. In 1996 his press-on style earned him six victories and a clear-cut title. He was obviously a man going places. Benetton chief Flavio Briatore had stepped in with a management contract, and after testing a Benetton, Trulli was placed with Minardi for his 1997 F1 debut. His first races revealed his flowing style, and when Prost's Olivier Panis broke his legs in Montreal in June, team owner Alain Prost lost no time in snapping up the young Italian as the Frenchman's stand-in. Trulli responded well, leading with complete confidence for half of the Austrian GP, and then finishing fourth in the German after tricking no less a person than World Champion-elect Jacques Villeneuve into a mistake. Trulli remained with Prost for the following two seasons, but the team had lost momentum once again and he was consigned to an uphill struggle with an uncompetitive car. Having come so far, so soon, in 1997, he found the lack of success particularly tough to endure and his relationship with the team went through a bad patch. This was unfortunate, for when the chance presented itself, as it did in the extraordinary GP of Europe at the Nurburgring, Trulli stayed cool under serious pressure from Rubens Barrichello and brought his Prost AP02 home an excellent, though fortunate, second behind Johnny Herbert's victorious Stewart-Ford. He moved to Jordan in 2000. He stayed two years but JordanÕs performance had peaked and there were no major results. In an effort to revive his flagging career Trulli moved to Renault in 2002 but the team was rather a disappointment and Trulli went into 2003 looking for something to reignite the spark that had once burned so brightly. In 2004 however he was a changed man and this culminated in a dominant victory at Monaco. Soon afterwards Renault decided not to re-sign him for 2005. Trulli lost motivation and scored no major results for the rest of the year. He signed for Toyota and indeed began racing for the team at the end of 2004 after Renault decided to replace him with Jacques Villenuve. 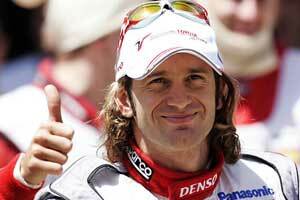 He stayed with Toyota in 2005 and 2006 but remained inconsistent, blindingly quick one day and off the pace the next. He stays at Toyota in 2007.